JANE: For the last couple of weeks, Alan and I have been chatting about loan words and how they complicate the already complicated job of English-speakers communicating with each other. This week, I’m going to ask him about the arts. Alan, art is a place where a I see a lot of loan words here in New Mexico. As I mentioned in my Wanderings for 9-15-10, our State Fair has three or four different art shows. Through them, I’ve become familiar with the difference between bultos and santos. Both are New Mexico Spanish religious art. A santo is a flat panel elaborately painted and often with a carved border. A bulto is a three dimensional sculpture. Both use traditional iconography associated with different saints. The artists who make these are called santaros and are highly revered. ALAN: Absolutely; art is a very strong cultural influence. Maori have a tradition of tattooing (moku) that goes back many hundreds of years. The designs are formal and meaningful and often sacred. The current fashion for tattooing has seen an upsurge of Maori-influenced tattoo art. JANE: When I was in New Zealand, the gift shops were full of Maori art. In fact, I still use the pencil holder I bought then. I believe it was carved from some sort of giant reed, and the striping is the natural coloration of the wood. ALAN: Yes – it’s called ponga, and the striping effect is really very attractive. You can also get jewelry (and weapons!) carved from native jade (greenstone; the Maori word is pounamu). Native woods, mainly kauri and rimu, also lend themselves to carving and they have a beautiful finish. Again, traditional, often sacred, Maori representations have had a considerable effect on contemporary carving. JANE: It’s good to hear that Maori art has been allowed to evolve into contemporary carving as well. There’s something sad about a formerly living traditional form become nothing but tourist junk. Here in New Mexico, the traditional arts are also alive and evolving. At the State Fair there were a couple of paintings after the manner of santos, but using superhero style as well. Without reading the title of the painting, I could tell Jim what three saints (Michael the Archangel, St. Frances, and Saint James) were depicted just from the symbols assigned to each superhero. I found it a fascinating blending of the modern and the traditional. ALAN: The Maori influence is also seen in areas other than the visual arts. My wife Robin sings in a kapa haka group. If you wanted to be completely traditional about it, a kapa haka choir would sing only Maori songs. But these days, while traditional songs are still a large part of their repertoire, they also sing many other songs as well, but in a Maori style of course. This involves choral singing accompanied by traditional dance movements and, depending on the song, a solo chant on the backbeat rising above the choral accompaniment. The effect is eerie and dramatic. I love kapa haka; it makes the hairs on the back of my neck stand up. Robin is Australian, but that doesn’t matter. Her group has a Chinese lady and several pakeha ladies without a trace of Maori ancestry between them. I was chatting once with one of the actual Maori members of the group and I told him that when I watched the performances I liked to play the game of “spot the Maori”. He laughed. One reason that Robin loves singing with the group is because of the Maori songs. Many Maori words begin with the letters “wh” which is pronounced “f”. And so a perfectly legitimate word like whakenuia (no – I don’t know what it means) comes out sounding really rude. She claims that Maori is the only language that allows her to shout the f-word at the top of her voice without giving offence. JANE: Excuse me… I’ve got to swallow a giggle. Sometimes the cross cultural loans here in the U.S. get incredibly complicated. The squash blossom necklace is my favorite example of this. As a gardener, I was always puzzled why these were called “squash blossom” necklaces, because the “blossoms” looked nothing like those of the squash. Then, at a museum, I learned the explanation. When the Spanish taught silver-smithing to the Indians, they wanted the Indians to execute designs that would sell in the European market. Therefore, the Indians were taught to make a design the Spanish had adopted from Moorish invaders – a pomegranate. ALAN: That’s fascinating. However, I thought I read somewhere that the American “Indians” prefer to be called “Native Americans,” since, after all, they have nothing to do with India. Let me answer your question first. Here in New Mexico, “Indians” rather than “Native Americans” is preferred. Even better is to know what the person’s tribal affiliation and use that – something that can become amazingly complicated given the amount of inter-marriage between tribes. ALAN: Tribal affiliations are very important here as well. Maori define themselves in relation to their whanau (extended family), hapu (a clan, or larger kinship group) and iwi (tribe). JANE: And now for the tie between American Indians and India… There’s a reason that the patterns on early Navajo rugs look like something that might come out of India… Once again, the market – in this case, the American market, rather than the Spanish – found it easier to sell such patterns and the trading posts encouraged the native weavers to manufacture such. Over time, the art has evolved, but the influence remains. JANE: That’s true! I’m sure Cristobal Columbo would be very happy to know he had found India after all. This entry was posted on August 4, 2011 at 1:00 am and is filed under Thursday Tangents. You can follow any responses to this entry through the RSS 2.0 feed. You can leave a response, or trackback from your own site. 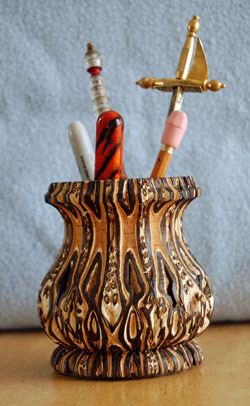 Jane, I think your pencil holder is carved from ponga (Cyathea dealbata) which is a tree fern. I’ve got a pounamu mere, but unfortunately, it was made in California from jade from British Columbia. Still stunning, though, in several senses. a santo is not a painted flat piece. that would be called a retablo. a santo and a bulto are both three dimensional. You’re right… Although here in New Mexico “santo” is often used for all forms, with retablo for the flat painted version (and not used very commonly) and bulto for 3-d pieces. Yesterday, I was in Old Town and one gallery had little flat pieces and they were definitely called “santos.” I suspect there is a regional element.